This is a cross-post from Nicholas Burke at Melting Glacier Analytics. 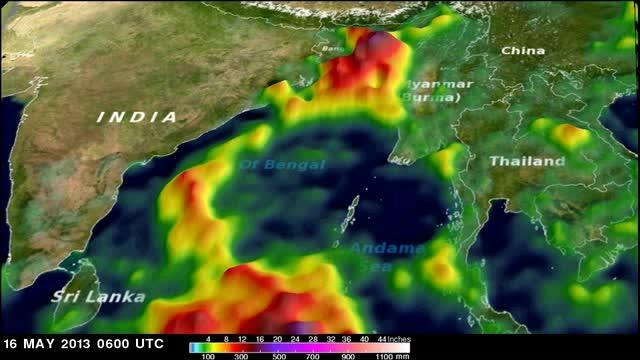 In the coming weeks, an atmospheric river may be flowing over the Bay of Bengal, and the implications could be nothing short of historic. Late May and early June marks the beginning of Myanmar’s annual monsoon season. Last year, extreme monsoonal rainfall patterns were cited by Myanmar’s Department of Meteorology and Hydrology as being linked to climate change. Excessive rainfall from the monsoon’s offshore low extended inland an additional 300 miles more than usual, resulting in severe flooding and the internal displacement of tens of thousands of people. This year, the dangerous monsoon pattern comes as 125,000 Rohingya Moslems are internally displaced in dire conditions in Rakhine state–a situation that has received increasing attention as Myanmar has begun to re-engage with the international community. When Cyclone Mahasen plowed through the Bay of Bengal just a few weeks ago, the Global Disaster Alert and Coordination System (GDACS) issued a “red” disaster warning of potentially high humanitarian impact across the region. UNOCHA chief Valerie Amos warned that the cyclone could impact millions across the region. On the minds of many were the plight of the Rohingya, and the recent memory of 2008’s Cyclone Nargis. Nargis claimed over 138,000 lives as Myanmar stifled external relief operations in the months following post-landfall recovery. But things are dramatically different this time. From a meteorological perspective, Mahasen weakened and veered into well- prepared Bangladesh, sparing a direct impact on Rakhine state. From a governance perspective, Myanmar is visibly different than what it was in 2008. Myanmar now hosts a full time US Ambassador, was visited by former Secretary of State Clinton, and received an unprecedented speech from President Obama in Yangoon. According to the Economist, Nobel laureate Aung San Suu Kyi’s images can be found on paraphernalia on nearly every street corner, and its opening to the outside world is a “golden opportunity” that can not be wasted. And yet, extraordinary challenges remain. The plight of the Rohingya are a chief obstacle to Myanmar’s full re-emergence on the geopolitical stage, and the well being of this population is directly tied to a potentially climate change-exacerbated 2013 monsoon season. The effectiveness of humanitarian operations and Disaster Risk Reduction efforts in the coming weeks are paramount not only to one of the world’s most disenfranchised populations, but to Myanmar’s ongoing reemergence and recovery in the eyes of the international community. There is an enormous historic opportunity at stake, and engaging with international humanitarian actors including fellow ASEAN nations could be a golden opportunity within a golden opportunity. For the displaced Roinghya, there is little room for error. By Caitlin Werrell and Francesco Femia in climate and security on May 28, 2013 .